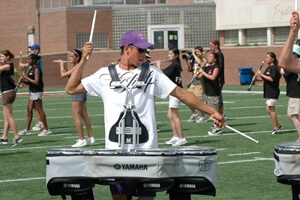 Hundreds of music students were treated to eight World Class drum corps performances Friday, June 26 as Drum Corps International's Central Illinois Premier Event marked the culmination of Music For All's (Bands of America) 2009 Summer Symposium. Students from around the country and world spent the week at Illinois State University, following one of many specialized "tracks," including marching band, concert band, orchestra, color guard, percussion, jazz or drum major. Carolina Crown provided some of those campers with an extraordinary experience—Crown members and staff worked with the 100 Summer Symposium marching band students throughout the week, and the young musicians had the opportunity to share the field with the corps as the encore to Friday's Drum Corps International competition. They learned a portion of Crown's 2009 show, "The Grass is Always Greener," including the music and accompanying visual drill formations. Students said they were ecstatic to perform with the World Class corps and that they learned a lot along the way. Chris Clark, a trumpet player from Indianapolis who has attended the camp for four years, said corps members really cared about the campers. "They really make you feel like a family," he said. "There were a few people that helped me out with tips and stuff, telling me what I could do better, which was cool." High school trumpet player Sarah Fairburn performed with Carolina Crown and said the camp caused her to decide to major in music in college. She hopes to teach and maybe even direct a corps someday. "I can't even put it into words because it's what I dream about," she said about the experience. "I love marching band, it's my life. Out here with the actual corps, it's just amazing." The students weren't the only ones who enjoyed the joint performance opportunity. 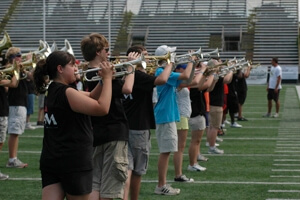 "My experience with the Bands of America kids has been really cool," said Crown mellophone player Holly Maldanado, who is a third-year member of the corps. "I talked to a few of the kids and found some from my state. It's cool because at that age they have so much potential, so much that they don't know they can do." Danielle Deditz, another member of Carolina Crown's brass section, said it was fun to give the campers the opportunity to work with the corps. 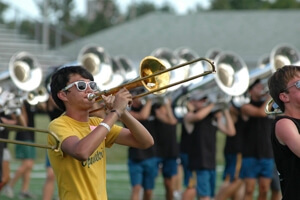 "It's not an everyday thing to get to work one-on-one with a drum corps." she said. "I wish our drill was more spread out so we could perform a little closer to them, but they're just happy to be on the field with us." The corps made sure the experience was special for the campers. "We formed a circle around the students and told them about how our circle is sacred and there's not that many people who get to sit inside it. We played a few parts of the show for them, which, judging by the looks on their faces, they really enjoyed," Deditz said.